Dad's little area was the only clear spot in the entire living space. It had been hard to imagine, but there it was: five square feet of space. That was the extent of his life, dawn to dusk. Mom was standing in the middle of the room, looking at me as if she were about to be the victim of a purse-snatching and had just identified the would-be perpetrator. It had been years since Sue Whitmer set foot inside her parents' house. Born and raised in the Midwest, the Voorhees resident rarely ventured back. When she did, her parents found reasons why she couldn't come to the house. But in 2005, when emergency personnel rushed to her ailing father's rescue, her mother's secret hoarding came to light. "He was in a real mess," said Whitmer, who was shocked by what she saw when she flew back home. "He hadn't bathed in months." Getting him out of it proved to be his children's nightmare. Whitmer was so disturbed by what she and her sisters experienced, she wrote a fictional novel based on her family's ordeal. 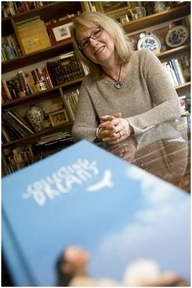 Called "Collecting Dreams," the book is meant to help others learn from her family's experience. "It's reduced me to tears on a number of occasions, mainly because of the shock of it," said Whitmer, a 58-year-old insurance account executive whose mother agreed to the book. "They're so bright, both of them." Hoarding disorder is a growing phenomenon, now recognized by the American Psychiatric Association's newest edition of its Diagnostic and Statistical Manual of Mental Disorders. Difficult to treat and hard to manage, the disorder is believed to affect between 2 and 5 percent of the population, according to a 2012 study published in the Journal of Community Health Nursing. It has spawned two reality shows, TLC's "Hoarding: Buried Alive" and A&E's "Hoarders," along with an industry dedicated to cleaning out cluttered homes. Inspired by a close family member's hoarding, Ronald Ford Jr. of Camden launched his clean-out company, Hoarders Express, about a year and a half ago. His business handles one or two homes a week. Typically, he is called in by a relative, though only a homeowner is allowed to sign the contract giving his employees permission to haul away their possessions. A lieutenant colonel in the Army Reserve, Ford handles the logistics: bringing in the workers, finding containers and storage, donating usable items to Goodwill and hauling ruined possessions off to a landfill. Though sometimes his employees bring rakes and shovels into the house, helping a hoarder is emotionally delicate work, Ford explained. Often, family members are brought in to persuade homeowners into giving up junk. But it's not easy. Ford once found a wedding dress stained with animal urine buried in a client's home. The client kept the dress. "When people buy or hoard things, they're missing something in their lives," Ford noted. "This hoarding fills a void." Hoarding disorder is a treatable condition, according to Stratford psychologist David Raush, but it's usually a slow and arduous process. Raush said he receives a number of calls about potential hoarding clients each year, but "few actually follow up." "Their behavior seems rational to them," Raush explained. "They're less inclined to get help with it." The doctor has visited the homes of clients with hoarding disorder so he can see for himself how severe the problem is. They try to downplay it. "Sometimes folks bring in photos," Raush observed. "But to see it is compelling." Hoarding creates a dangerous home environment, explained Bryce Priggemeier, a career firefighter who co-owns Sensitive Matters Recovery Specialists with his father, a retired police officer. The Mullica Hill-based company cleans up crime scenes, but 75 percent of its work is cleaning out the homes of hoarders. Usually, the company is called in by the homeowner or a family member or neighbor. But increasingly, the problem is noted by code enforcement officials after emergency workers or police are called to the home. Cluttering can prevent a home's inhabitants from getting out in case of a fire, Priggemeier explained, and makes it harder for firefighters to do their job. The threat of fire is a primary concern for code enforcement officials. "That's something we put across to our customers," Priggemeier said. "That turns the light bulb on." In Whitmer's case, hospital staff warned they could call the police on her siblings for a possible case of neglect, even though their mother had stymied their previous attempts to help. Faced with that threat, Whitmer's mother agreed to a clean-out. By that point, it was so bad, Whitmer recalled, "I was afraid to breathe when I entered. It was putrid." Her parents' finances were equally disastrous. Whitmer and her sisters learned they had eight credit cards and more than $100,000 in debt. They were forced to sell off land to set things straight. Today, the main living areas of the house are clean, though Whitmer's mother has started to collect recyclables in her closets. A doctor makes house calls and home health aides come in regularly to help care for Whitmer's father, now 82. Though her mother never did get counseling, the author did. That taught her the negotiating skills she needed to help her parents. And that's the toughest part for anyone who works to help a hoarder. "Regardless of what you and I might think, it is their property," Priggemeier acknowledged. "Ultimately, they have the right to say yes or no." Reach Kim Mulford at (856) 486-2448 or kmulford@gannett.com. Follow her @CP_KimMulford. * Sue Whitmer's new novel, "Collecting Dreams," is available online at amazon.com, BarnesandNoble.com, and through bookstores. I just read about a mom with two teenagers who was arrested because she had 60 cats living in her house. When there is an excessive number of animals in a home, it creates a serious health hazard. Living with animal waste, hair, ticks, fleas and animal-borne diseases can be dangerous for people, especially those with weakened immune systems, pregnant women and young children. And it's a health risk for the animals if they're sick, malnourished and have wounds from fighting for territory in crowded conditions. But what's often overlooked is the cause of this misery: It's an emotional disorder called animal hoarding. Around 3,500 people, with an estimated 250,000 animals, come to the attention of authorities every year. Animal hoarders "collect" animals because they're compulsively driven to care for them; according to the Anxiety and Depression Association of America, the neglect and abuse of the animals is accidental or unintentional -- but the person is unable to prevent it. The hoarders often develop the obsession with caring for and loving pets after a trauma or loss. They also frequently have severe adult ADHD, which makes it difficult for them to keep their living space clean and orderly. They combine extreme neglect of animals with extreme neglect, emotionally and physically, of themselves. But animal hoarding can be treated with cognitive behavioral therapy that helps a person give up old habits and develop new ones. Without treatment, 100 percent of animal hoarders will relapse: Removing the animals just clears out space for more. A special note: Children of hoarders need support and therapy too; they suffer greatly from their parent's affliction. They can find info at ChildrenofHoarders.com.